TechLuck - Green Energy Forum - LTO Lithium Titanate Batteries For Solar? TechLuck - Green Energy Forum › Green Energy › Green Energy Talk › LTO Lithium Titanate Batteries For Solar? 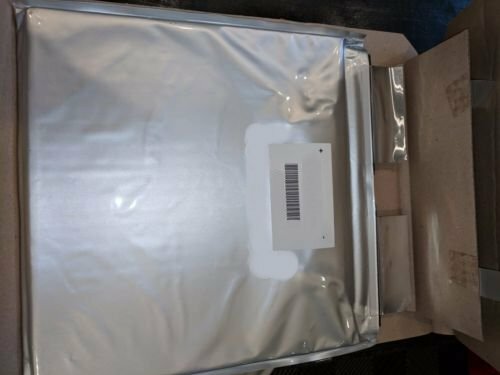 Re: LTO Lithium Titanate Batteries For Solar? I never heard about "super capacitor balancing", do you know how this works or do you have a link to this balancer? about the 30s BMS: have you concidered about building 2 batterie packs each with a BMS and wire it up in series later? 2 x 15s or one 14s + one 16s BMS should be plenty of choices. If you get the flat pack cells made by Kokam, the tabs/terminals at the top are a very soft aluminum and are long and straight. For my test pack I used a Leather Punch Tool that you can get at Walmart in the craft section. I think the biggest hole size is 3/16" or .188" on the tool. I punched two holes to match a metal piece from Home Depot in the cabinet hardware section called "Mending Plates" the 2 in. long ones with two holes are perfect for this, zinc plated, I used 2 plates per terminal. I used short 10-24 3/8" phillips pan head screws and nuts with lock washers, internal style. 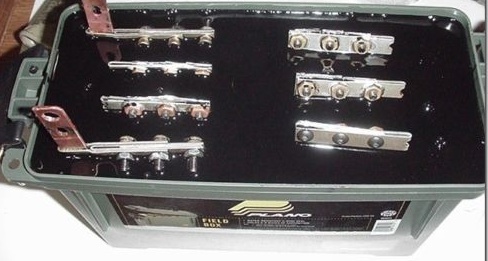 Longer ones were put on the end plates for connection to wire lugs. I had to hold the plate with my thumb, then used a scribe tool inside the holes to make a mark, then used those marks to punch. While punching I squeezed hard and then gently twisted sideways only slightly back and forth and I could feel when the hole was done. After one hole was done through TWO terminals, I would insert a screw and nut temporarily and check everything else for alignment, then punched the other hole. I think the punch is better than trying to drill holes. I had to be SUPER CAREFUL to insulate the terminals and operated on only 2 cells at a time basically. I worked backwards and numbered the cells as I went making sure they are aligned on top of each other for each one, then putting them aside in a safe way so the terminals don't touch anything. 2 cells at a time slowly and carefully, put one aside and move to the next one in order. If the punch tool ever shorted, these batteries will put out a lot of power really fast and so I was super careful and used cardboard to insulate other terminals and made sure I could concentrate the whole time and not be interrupted. No distractions. As I added in the screws to finish the stack after all the cells were correctly punched 2 at a time, I also put on a piece of black tubing used for "drip irrigation" with a slice down the length on one half, covering the entire terminal and screws, it just slips on from the side and that insulates the terminals and is cheap. This helps when using tools so I put them on as each connection was finished. I taped the cells together as a stack using some strong packaging tape when done because they will slip around and they are very heavy once assembled. I used them stacked on top of each other, they could probably be used sideways or with the terminals at the top with the proper container. Well, that's what I did and it worked. I don't think this is something just anyone can do, especially the - impatient in a hurry types. One "24V" 10S stack took probably 2 or 3 hours of total concentration. 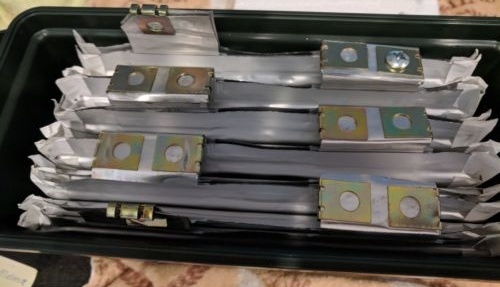 Below are some pics of OTHER PEOPLE'S BATTERIES for 12V, not mine. But the cell pic is the same type I used for 24V (10 pcs in my case). This single cell is about 10x10x0.5", about 55 to 60 Ah and gives me about 1 KWh out of the inverter (20V cut off) for 10 cells. The fast charging features are not a big deal for solar systems. But, they perform very well at low temperatures and extreme temperature tolerance from -22 degrees F to +131 F. Most other lithium's will either not perform or quickly degrade if operated in these temperatures . They are very stable and considered one of , if not the, safest of all lithium's. There is test data showing them charged to TWICE their normal voltages with no thermal runaway , and they continued to function properly. LTOs can be stored at 0 volts. There is a test online were they stored them over one year at zero volts and after 1 year there was no loss of capacity so if you have an application were there is a deep discharge or storage without the ability to keep on a charger these will work great. Other lithium's will be permanently ruined if they were to go below there minimum voltages.